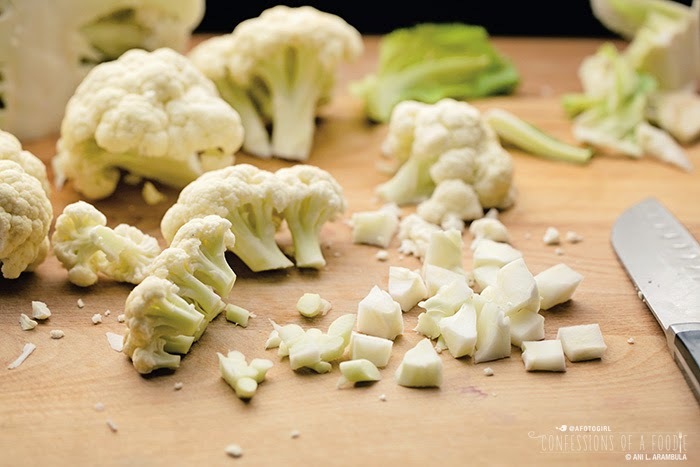 Cauliflower and celery root stand in for potatoes in this simple. 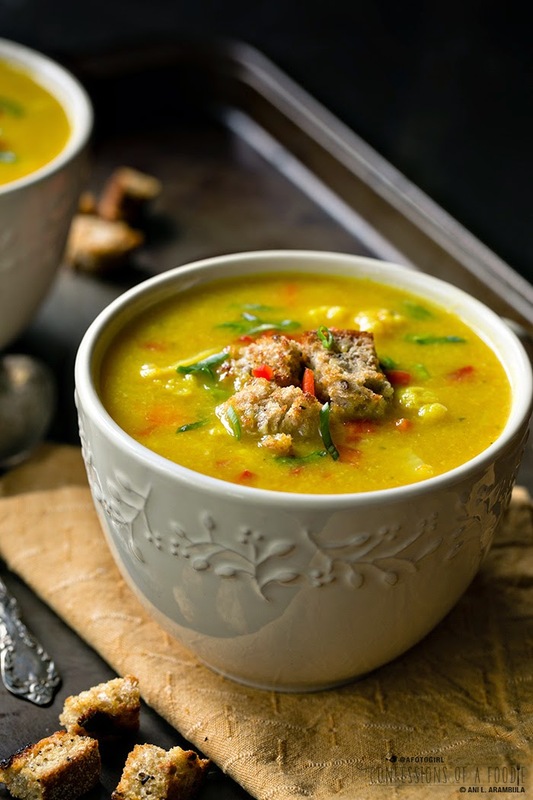 flavorful curried chowder. 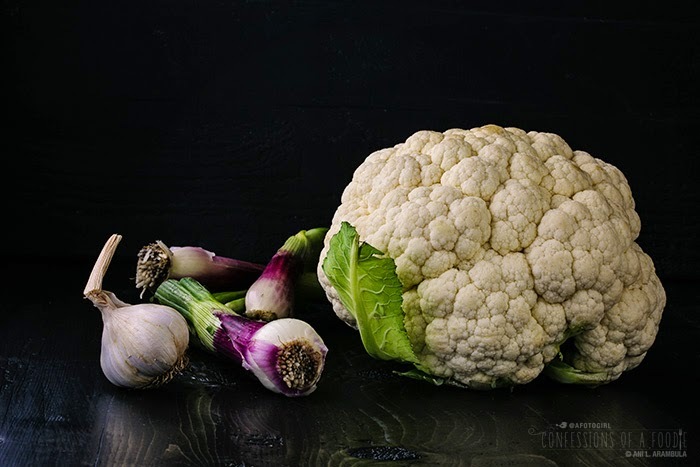 Cauliflower and celery root, also known as celeriac, meet up with curry and light coconut milk for a healthy, low calorie vegan chowder featuring produce from San Diego's Specialty Produce. This flavorful, gorgeous soup came into being after I was given a Farmers' Market Box from Specialty Produce during a San Diego Food Blogger's Instameet at their warehouse this past weekend. The box included a head of bok choy, a beautiful large head of cauliflower, three big gorgeous red spring onions, a head of garlic, two limes, a bag of parsnips, a bag of fingerling potatoes, hydro butter lettuce, two Hass avocados, one sumo mandarin orange, and one bunch of Easter egg radishes. Now get this guys, yes to be honest, I received this box as a gift in exchange for spreading the word about the Farmers' Market Box program. But this box with all this fresh from the farm produce if I had bought it would only have set me back $20. Let me rewind a bit to give you some perspective: I recently cancelled my first ever CSA membership from another outfit that was doing some pretty heavy promotion door-to-door in my neighborhood. The box from there was $26 and was delivered to my door, which was quite convenient and is what sold me on them in the first place. However, I cancelled because three deliveries in a row (I only stayed with them through four deliveries) half the produce was beyond it's prime. I mean, opening up the box and the kale (A LOT of it, by the way) was already turning yellow, tomatoes where starting to get wrinkled skin, fruit was either under ripe or overripe not to mention who really eats an entire box of shishito peppers three deliveries in a row? Also, delivery was on Tuesdays. I do the majority of my cooking on the weekends, especially for this blog. Come Saturday, most of the produce was no longer useable. Big waste of money. But the produce in this box? Gorgeous I tell you. 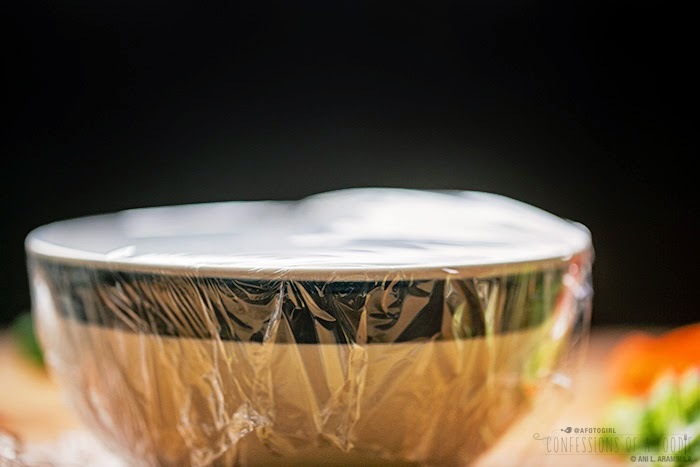 And talking with other food bloggers who have been getting boxes every two weeks for quite some time now, say the produce is so fresh that it easily will last the entire two weeks without showing any signs of spoilage. How is it that the produce from Specialty Produce stays fresh so long? Well, they have a 2-3 day turnover maximum for all the produce coming in and out of the warehouse. 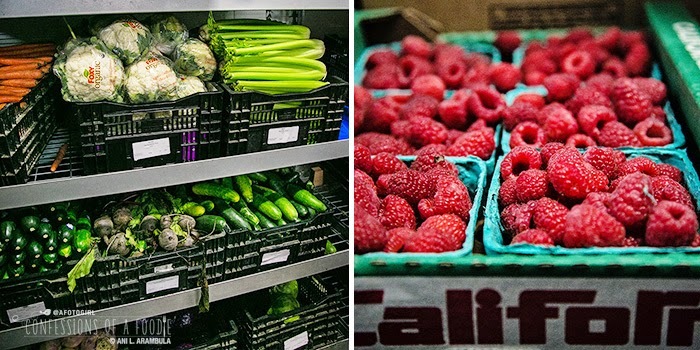 Restaurants in San Diego count on Specialty Produce to provide premium quality produce and the awesome part is that the warehouse is open to the public. Plus, we were told during the tour that they can pick and choose the best of what is available to create these Farmers' Market Boxes for their members. You just don't know how excited I am to hear this and how much I'm looking forward to signing up and receiving my next box! Okay, so toning down the excitement for a minute to get back to this soup. From the box, I pulled out the cauliflower, onions and garlic. Look at the color of those red spring onions! So gorgeous! The beautiful poblano I picked up at Specialty Produce while I was there for the tour. The carrot was already in my veggie bin at home. Also, I've had this celery root hanging around for about three weeks now, waiting for inspiration to use it. 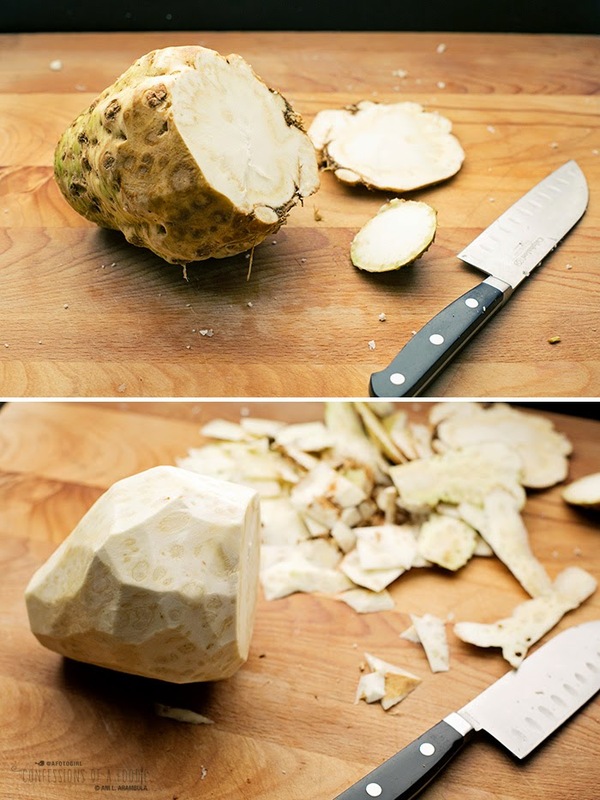 It's my first ever celery root, also known as celeriac, and truth be told, I've been a little intimidated by it's gnarly looks to attempt cutting into it and using it in recipes. However, I've been told by a few that it's a great stand in for potatoes. 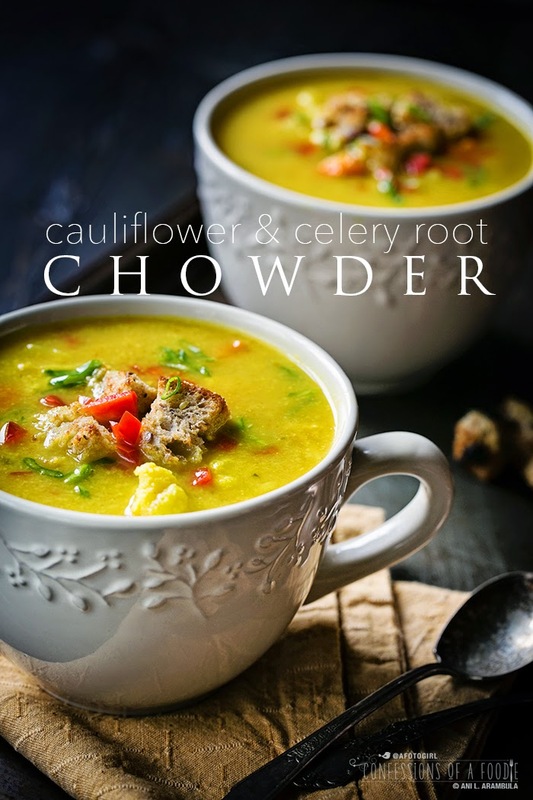 Looking at it and looking at my cauliflower, I decided chowder was the ticket. 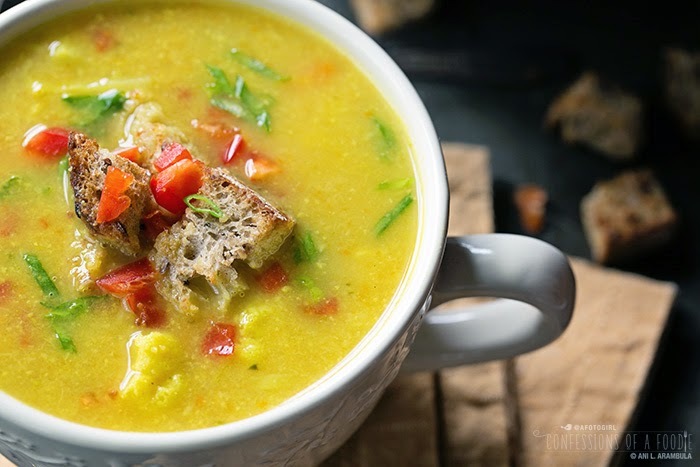 As I started gathering additional ingredients from my pantry, I saw I had light coconut milk and that's when I decided to keep this soup vegan, using the coconut milk in place of cream. Too keep the soup gluten free, I also decided that I'd puree part of the soup to help thicken instead of adding flour. Once I decided on the coconut milk, the spices naturally came together. I've added plenty of turmeric not only for it's gorgeous color but because the spice is beneficial as an anti-inflammatory and helps to reduce glucose levels and lower insulin resistance in Type 2 diabetes. Ginger helps improve insulin sensitivity so it went in, along with curry, coriander and a bit of ground cardamom. So that's pretty much how I often come up with recipes. One ingredient leads to another. Then that leads to another and before I know it, those ingredients are telling me which spices to use and how to prepare them. Sure, sometimes what I think the outcome will be is far from the reality and I'll need to tweak ingredients or preparation but just as often, a recipe will be pretty spot on right out of the gate. Like this soup. Look at the color of this soup! This is the half that was pureed before I added back the reserved whole vegetables. Such a gorgeous color. I wanted differing textures in the soup, so while it was simmering, I hopped into the car and drove to the nearest store to pick up a fresh loaf of whole grain bread to make my own croutons (Yay! for a break from the rain). The smell of the garlic croutons toasting in the oven, mingled with the soup bubbling away on the stove made my tummy rumble and made me impatient to finish the plated shot so I could dig in for breakfast (that turned out to be after lunchtime). This soup is warm and comforting. Perfect to keep the chill at bay. Continue to end for recipe. Specialty Produce is located at 1929 Hancock St, Ste 150 in San Diego (92110). There's plenty of street parking available with some reserved customer parking at the corner of Hancock and Noell Street. To enter, walk past the loading dock and up the walkway along the back fence. 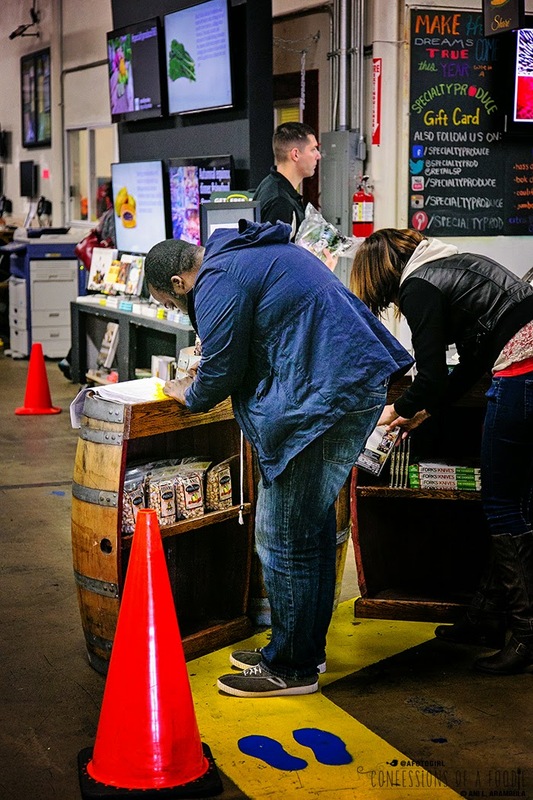 When you enter the warehouse, you'll find a painted yellow stripe on the floor that leads you to the check-in table. First-timers must sign a waiver of liability, it is, after all, a working warehouse with lots of pallets being moved about, wet floors and stacked boxes everywhere. Subsequent visits, no waiver signing is needed but you do still need to sign-in. Upon your first visit, the friendly staff is available to answer any questions or show you around to help familiarize you with what is available and where to find everything. Also located at the the check-in table are rubber gloves. You must wear gloves while shopping to avoid touching produce bare-handed. It's also highly suggested that you wear a jacket or sweater as the large walk-in coolers are very chilly. The first big walk-in cooler has both organic produce and sustainably farmed produce (for now, that is, as a new, larger, dedicated organic produce walk-in is under construction). All the produce looked so good, it made me want to take a little of everything! Seriously, the creative juices where flowing. When shopping, don't be afraid to pick whatever looks great to you. Feel free to open a box and take as little or as many as you like. The only caveat being not to separate produce that obviously is sold in bunches (carrots, radishes, etc.) or to tear into produce that is sealed in a bag (i.e., loose leaf lettuce, bagged herbs, 1 pound bags of produce, etc.). 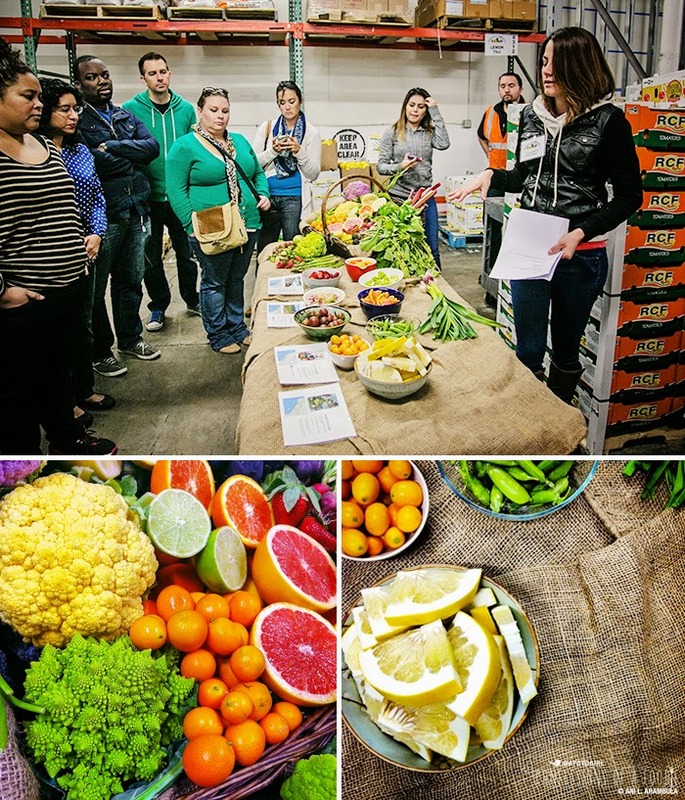 After the tour of the warehouse, lead by Cassandra Poindexter, Specialty Produce's Retail Manager, we got a little more history on the story of some of the produce available plus it was time to taste! Truly, the rainbow of colors was something to behold. Amazing to see what nature provides us with. Why would anyone want to eat orange puffs of air when they have these beauties staring them in the face? Real, whole foods equals health and wellness and lately, I can't get enough of it! Some food bloggers tasting the biggest sugar snap peas I have ever seen. They were so incredibly crisp and sweet, it was like eating nature's candy. From left to right, that's Broderick of savoryexposure.com, Mimi of mimiavocado.com, Brandon of kitchenkonfidence.com, and Holly of fmitk.com. For more information about the Farmers' Market Box, check out the information here. I made this vegan by using vegetable broth in place of my usual chicken broth and I swapped in light coconut milk in place of heavy cream. Don't pass on the croutons or the bell pepper garnishes. The crunch from the toasted whole grain bread is a nice compliment to the tender veggies and the sweet, cool crispness of the bell pepper adds another layer of texture and flavor. To boast the nutritional value, I've adde nutritional yeast flakes. Feel free to leave them out. 1. Place a small cake rack on a gas burner. Place poblano on rack and turn heat to high. Roast until all sides of chile are blackened, turning chile by the stem (use tongs if needed). 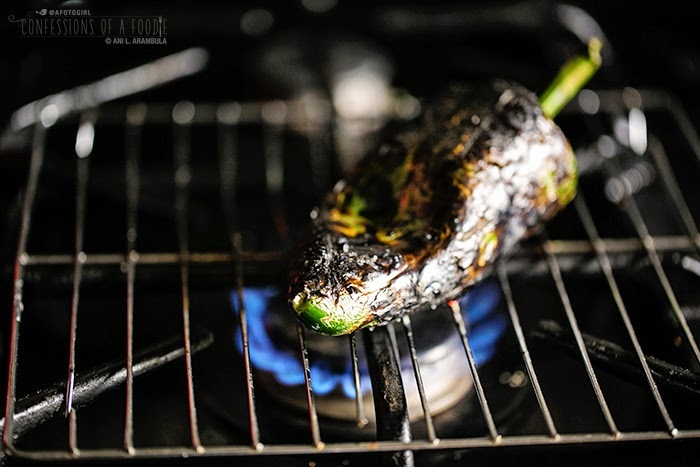 Alternately, place chile on a small rimmed baking sheet and set under a broiler to char. 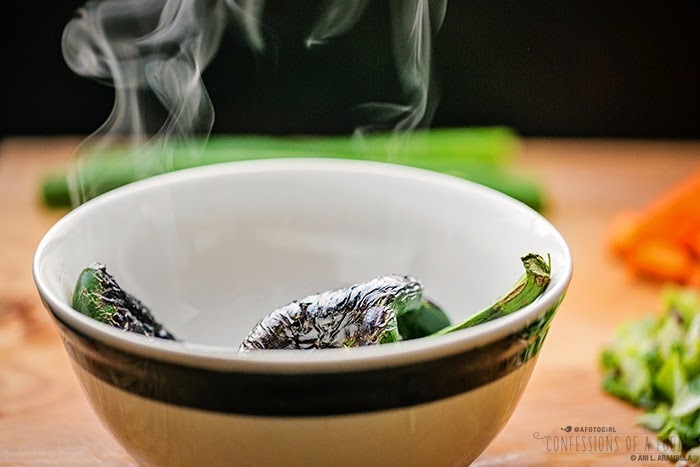 Remove charred chile to a small bowl, cover with plastic wrap and set aside. 3. Chop cauliflower, celery root, carrots, onions and garlic. Place a dutch oven or heavy bottomed soup pot on medium heat. Drizzle in olive oil. 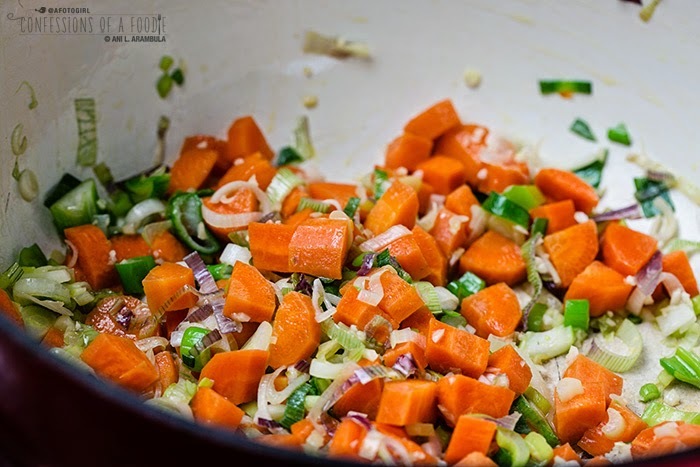 When shimmering, add onions, carrots and garlic. Cook for 5 minutes, stirring often to keep garlic from burning. 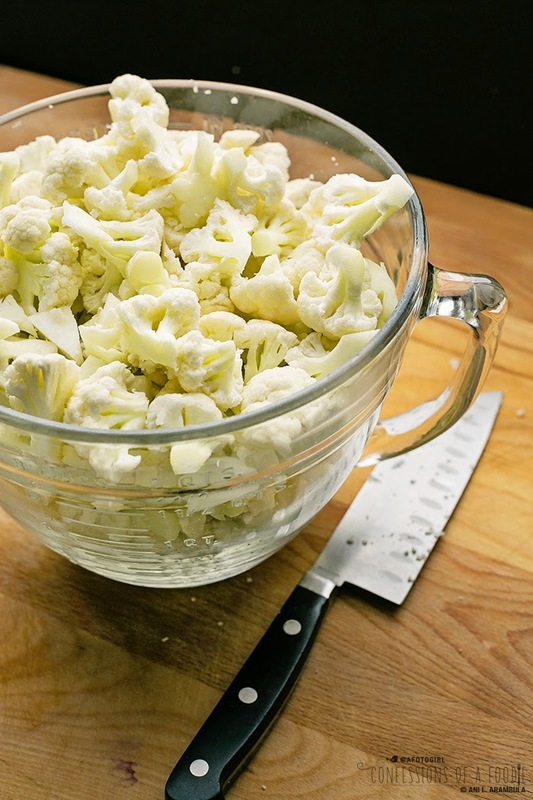 Toss in the cauliflower and celery root. Pour in broth; add spices, stirring well to incorporate. Bring to a boil, reduce heat, cover and simmer. In the meantime, remove chile from bowl and peel away charred skin. Do not rinse chile. 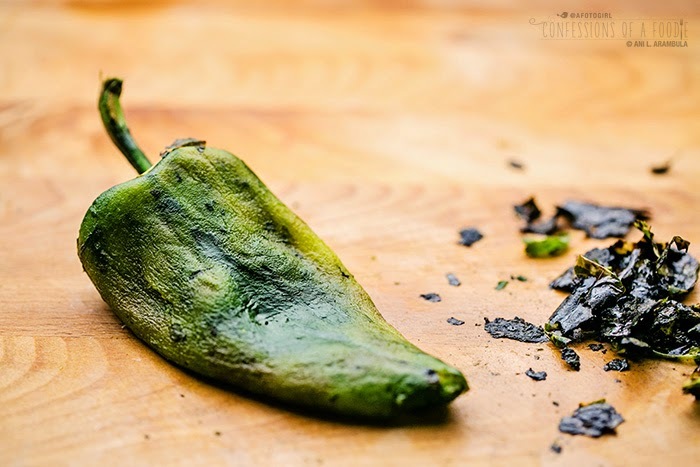 If necessary, rinse hands often to remove charred chile skin from hands while peeling. Cut top off of chile, run knife down length of chile to open up and remove all seeds. Chop chile and stir into soup pot. Continue simmering for 25 to 30 minutes or until vegetables are fork tender. 4. While soup is simmering, make croutons. Cut whole wheat bread slices into 1/2-inch cubes and place onto a rimmed baking sheet, piled in the center of the pan. Drizzle olive oil evenly over bread and top off with garlic. Toss well to combine and spread bread out across pan in a single layer. Sprinkle with a pinch of salt. Place sheet pan in oven and bake for 6 minutes. Remove pan from oven, flip bread with a spatula, return to oven and bake for 4-6 more minute or until golden brown. Remove croutons, place in small bowl and set aside. 5. When vegetables are fork tender, stir coconut milk into soup pot. Remove half of the vegetables from pot. 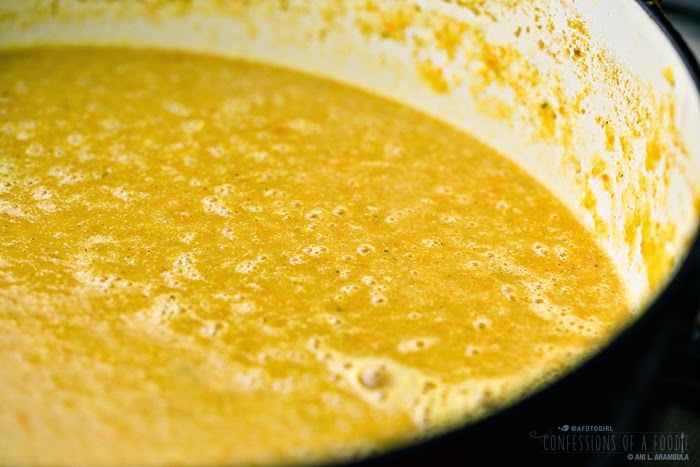 Use an immersion blender to puree the remaining soup in the pot. Alternately, add remaining soup to a blender, in batches, and blend until smooth. 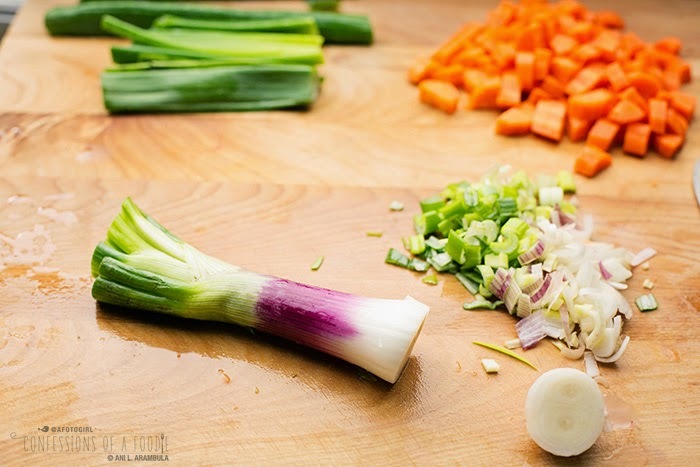 Return blended soup to pot along with reserved vegetables and stir well to combine. Taste soup for seasoning, adding more salt or pepper to taste. Divide soup between 8 large soup bowls. Top with croutons and garnish with peppers and onions. Squeeze a bit of lime juice over the bowls, to taste. Disclosure: I received one Farmers' Market Box from Specialty Produce as part of the San Diego Food Bloggers Instameet that included a tour of the warehouse and a tasting of some of their produce in exchange for social media promotion. No other compensation was received. As always, recipe and all opinions and observations are my own and not influenced by Specialty Produce. 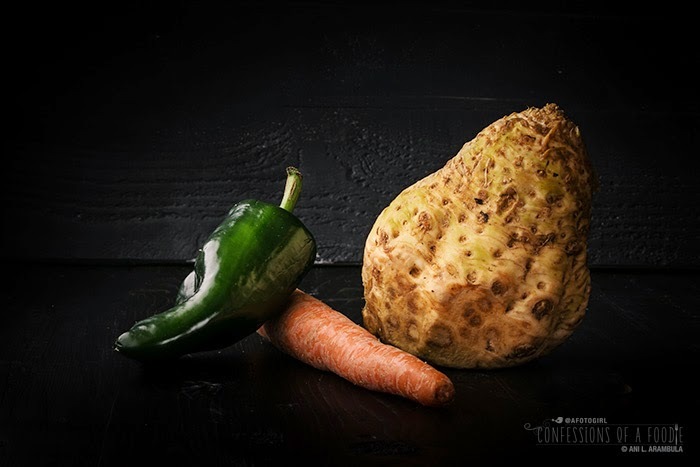 A gorgeous post - hope the folks at Specialty Produce enjoy it as much as I did. I might sign up for a box too...I live just up the street. So fun seeing you on Saturday! You pretty much captured my sentiments about other CSA boxes - when I got home and rooted through the FMB, I was very excited. It was like Christmas, but with produce! The soup looks great. Love that you've used nutritional yeast. 1. You totally caught me snacking on those amazing snap peas. I swear I was eating them the whole time we were standing around that table. So good! 2. This soup looks awesome!! Great use of the FMB ingredients.